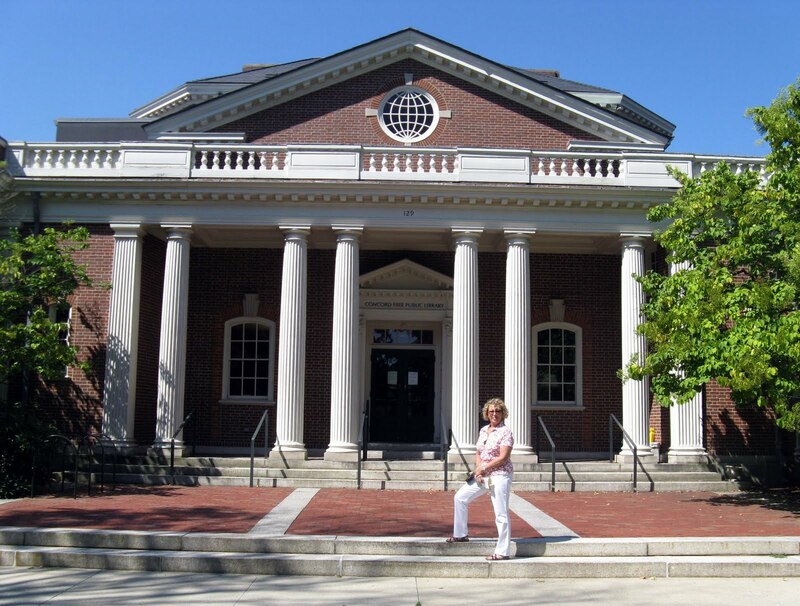 Several years ago Ann cut out an article in the Palm Beach Post about Concord, Ma. 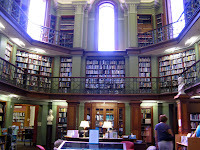 and its rich literary and revolutionary war history. As we were visiting our son, Chris, in nearby Worcester, it was an ideal opportunity to push on to Concord for a couple of days, stay at a B&B (North Bridge Inn, highly recommended) and see for ourselves. We decided to concentrate on Concord’s literary history, and its place at the crossroads of Transcendentalism with Emerson as the center of that universe. To walk where Emerson, Thoreau, Alcott, and Hawthorne walked is awe-inspiring. They were all contemporaries, living near each other. This is indeed a sort of holy ground of American literary and intellectual history. 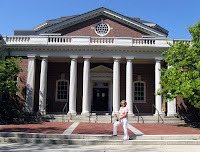 There is no better way to start such a trip than to visit the Concord Public Library, dedicated by Ralph Waldo Emerson when it opened in 1873. 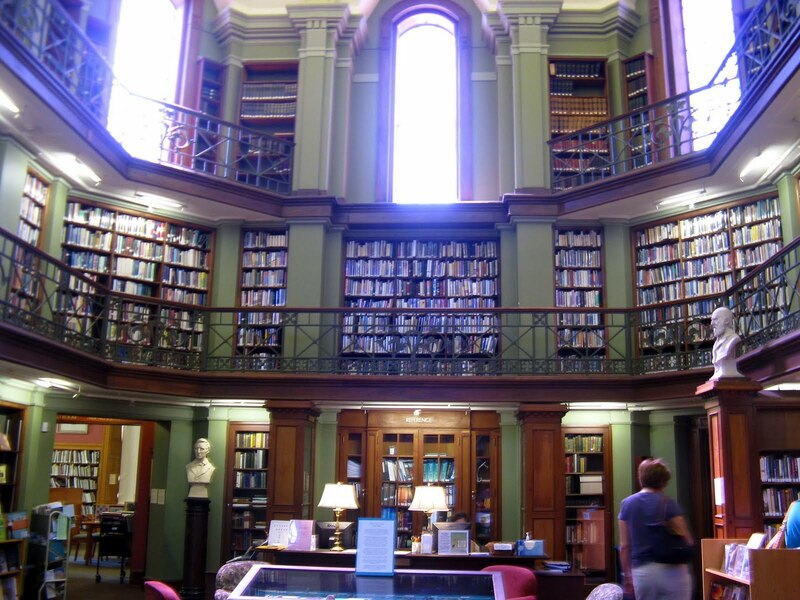 In this day of the Kindle and the iPad, it was refreshing to be in a traditional library, befitting the literary community which it is at the center. Inside one can find Daniel Chester French’s sculpture of Ralph Waldo Emerson. 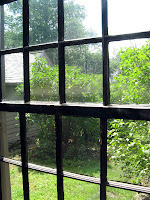 French’s tools were given to him by Louisa May Alcott. 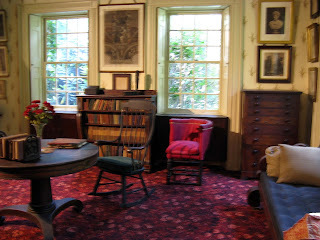 In the Concord Museum Emerson’s study is perfectly preserved, moved there after there was a fire in the Emerson home. Inscribed by my husband at sunset, April 3, 1843. In the Gold light. One can still see the smallest twig leaning “clear against the sky.” It would have been interesting to eavesdrop on conversations between Emerson and Hawthorne as Hawthorne was not a Transcendentalist. 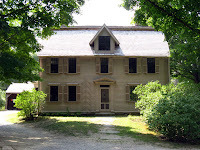 Henry David Thoreau (pronounced “Thorough” by the natives) is said to have planted the garden at the Old Manse as a wedding gift to the Hawthornes. The garden still blooms there. From the Old Manse Emerson’s grandfather witnessed the “shot heard around the world,” the opening volley of the American Revolution on the Old North Bridge. The Old Manse also houses a 1864 Steinway piano and I was surprised when the docent invited anyone on the tour to try it. Most items on these house tours are of the “look-but-do-not-touch” nature. As no one volunteered I stepped forward to play a few bars of Memories by Andrew Lloyd Webber, my apologies to 19th century sensibilities. It was out of tune, but all keys functioned, more than 150 years after this piano was built. The nearby Wayside is now a National Park property and tours of the home and the nearby North Bridge are conducted by Park Rangers. We were lucky enough to have had a private tour of this home. 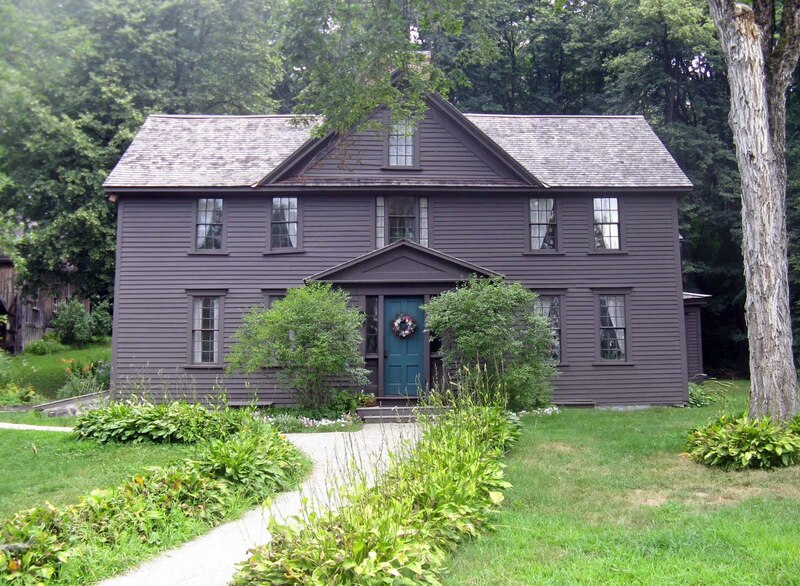 Louisa May Alcott spent her childhood there and many of the scenes from Little Women were set in her memory from that home. It is also the only home ever actually owned by Nathaniel Hawthorne who gave it the name, Wayside. 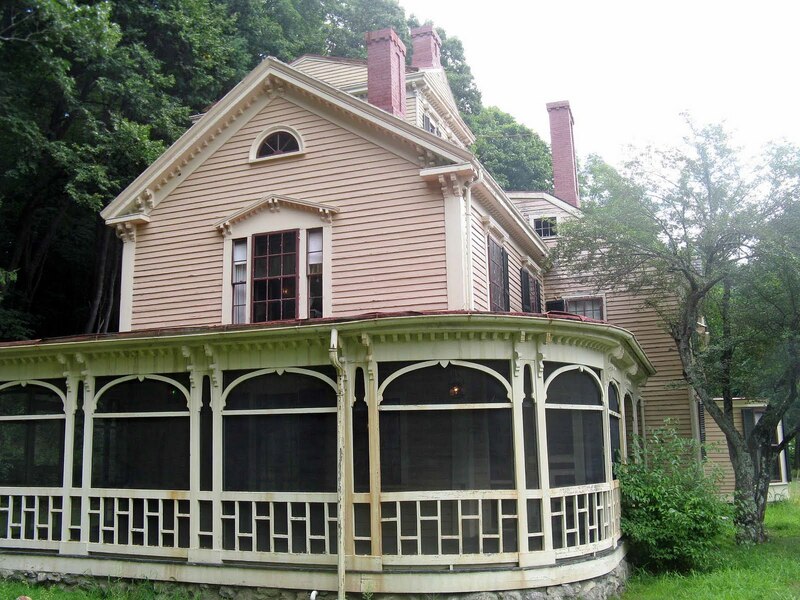 The tour of the Orchard House, where Louisa May Alcott actually wrote Little Women was inspired. The docent enacted several quotes from the novel, leaving one motivated not only t o buy the book (once again) but others as well in the gift shop. 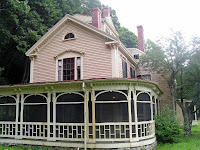 Alcott’s father, an educator who struggled to make ends meet, was an enlightened man, encouraging his daughters to learn, building a small desk for Louisa May (unheard of at the time), and having the pleasure of watching his daughter become one of the best selling author’s of her time, certainly making the family wealthy. That small, plain desk has been perfectly preserved. Father Alcott was devoted to Louisa May and she was devoted to him. Eerily, as the New York Times reported at the time in 1888, it is a noteworthy fact in connection with her life and death that Miss Alcott and her father were born on the same day of the month, and that they died within 24 hours of one another. A couple years ago we had the pleasure of touring Emily Dickinson’s home in Amherst. She is probably my favorite poet. 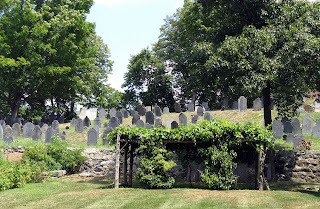 I wonder whether her relative isolation in Amherst, while the literary hotbed of New England was not far away in Concord, but far enough to remove her from that scene, might have contributed to the quiet loneliness of her poetry. I am not aware of Dickinson ever meeting the Concord group. He questioned softly why I failed? We brethren are," he said. Our wonderful tour of Concord was concluded by having dinner at the Walden Grill with my best friend from college, Bruce, and his wife, Bonnie, residents of nearby Sudbury, and both dedicated teachers of literature. 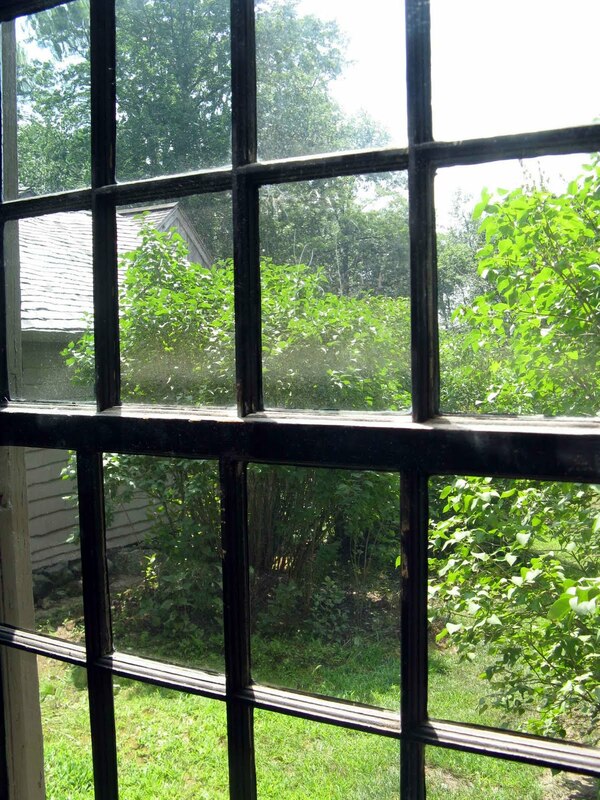 Perhaps learning, teaching and literature are in the water of Concord, Ma. and its environs!